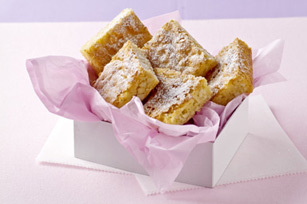 These luscious cookie bars are flavored with white chocolate, almond extract and slivered almonds. Mix flour, baking powder and salt until blended; set aside. Microwave chocolate and butter in large microwaveable bowl on HIGH 2 min. or until butter is melted; stir until chocolate is completely melted and mixture is well blended. Add sugar; mix well. Blend in eggs and extract. Add flour mixture; mix well. Stir in nuts. Spread onto bottom of prepared pan. Balance out your food choices throughout the day so you can enjoy one of these bars.